A new reverse design for the 2013 Native American $1 coin was unveiled by the United States Mint last week. 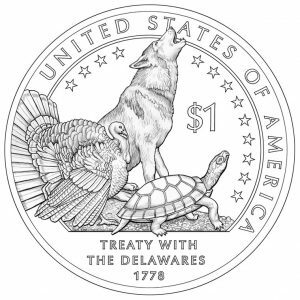 The dollar design represents the theme of "The Delaware Treaty (1778)." Expected to debut early next year on new $1 coins, the design marks the fifth in a series of annually changing reverses to appear on Native American coinage. Congress mandated rotating dollar designs with the passage of the Native American $1 Coin Act. Reverse designs are required to celebrate the "important contributions made by Indian tribes and individual Native Americans to the development of the United States and the history of the United States," under the terms of the Act that is Public Law 110-82. 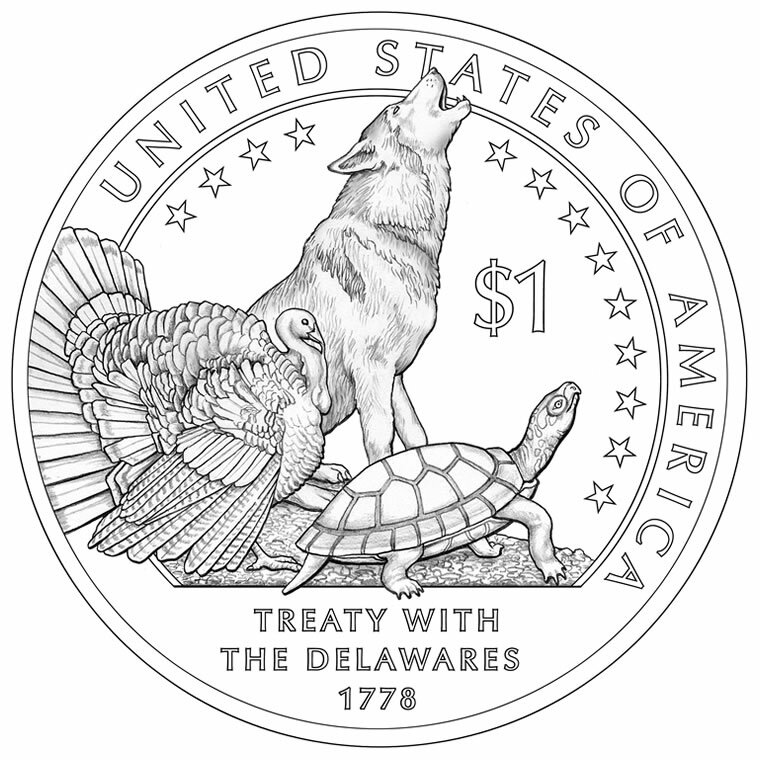 2013 Native American dollars feature a reverse design that is emblematic of the Delaware Treaty of 1778. After having declared independence just a few years before, the first formal treaty signed in the name of the United States was with an Indian tribe, the Delaware, at Fort Pitt (now Pittsburgh) on September 17, 1778. Inscriptions surrounding the scene include TREATY WITH THE DELAWARES, 1778 and the standard annual inscriptions of UNITED STATES OF AMERICA and $1. U.S. Mint Artistic Infusion Program Master Designer Susan Gamble designed the reverse with U.S. Mint Sculptor-Engraver Phebe Hemphill in charge of sculpting. Designed by Glenda Goodacre, obverses show an image of Sacagawea and her child as seen on all of the related dollars since 2000. The famous Shoshone woman accompanied explorers Lewis and Clark on their expedition through the frontiers of America. The inscriptions "LIBERTY" and "IN GOD WE TRUST" surround the portrait. An edge inscription is placed on each coin indicating the year of production, a mint mark for the facility that produced it and "E PLURIBUS UNUM." Standard circulating and uncirculated quality coins are struck at the U.S. Mint facility in Philadelphia with a mint mark of ‘P’ or the U.S. Mint facility in Denver with a mint mark of ‘D.’ Proof quality coins are struck at the U.S. Mint facility in San Francisco and bear a ‘S’ mint mark. Native American $1 coins are composed from 88.5% copper, 6% zinc, 3.5% manganese and 2% nickel. They feature a golden color with a diameter of 26.5 mm and a weight of 8.1 grams. Each of these products, when released, are found directly on the U.S. Mint product page located here. Nice idea to document and make tribute to Native Americans via coins. Do you think they’ll just call it even for taking their land? If that struggle were happening today, would they be called insurgents or freedom fighters? How would fair and balanced news channel report it? Kevin, My children and grandchildren are part “Native American”. I doubt if any of them would see this coin as an affront. We seem to never “just let things go”. As to the coin, as this is a site that deals in coins, it’s quite handsome. I wonder about the Mint, however. They’ve seen the profit in selling reverse proofs. I’m afraid that they will get carried away and we will saturate the collector’s market with them. I wish the mint would see that we see some items as special and wish to leave them special. I’ve purchased every reverse proof the mint has made, if I buy this coin, it will be due to the design, not the uniquness. There is very little unique about reverse proofs any longer. What is it about you lib-tards that always want to make an issue out of something that doesn’t exist. If you’re so guilt ridden visit the closest Indian reservation go into their gambling institutions and lay down some of your coin and help them pool up their profits so they can buy their land back. It will help you finally feel good about yourself, and use some of those over produced silver walking liberties in their dollar slots, it will speed up the process. One has to love Obama sycophants. They have to ruin everything, including coin collecting. Obama’s administration has printed more money than all the other administrations put together. Albeit electronically. Thus, it keeps getting harder to make a living each year with inflation run amuck, no matter how they try to obfuscate. No matter which politician says they have the answer, none do. The problems that have been created will not be solved by mankind. This is a bunch a baloney if you ask me. President Obama continues to keep our country on track even with increased scrutiny. Thank you for support our president as this shows your maturity and keen sense of leadership. Squatrack must be either insane or mentally retarded. Obama has been the most corrupt “president” in this country’s history. Of course the left wing media will never be honest about this communist creep due to the fact that he’s not only a left wing extremist, he’s also not white, which makes him innocent in their eyes of all the wrongdoing he and his stooges like Holder are guilty of.